View All Hair Dye There are 332 products. For a hair colour that's almost too hot to handle, check out the bold and beautiful Crazy Color Semi-Permanent Hair Dye in Fire Red, the ideal way to create a sizzling style! Want a rich and sumptuous new hair color? Then check out the Crazy Color Semi-Permanent Hair Dye in Aubergine, the ideal shade for any fan of deep and dark hues! Turn your look a few dramatic shades darker with the Crazy Color Semi-Permanent Hair Dye in Black! You'll be sporting an all black look in no time! Your hair dye hunt is over! Come and check out this awesome shade of Crazy Color Semi-Permanent Hair Dye in Blue Jade. The search for your next new favourite hair color is over now you've discovered the Crazy Color Semi-Permanent Hair Dye in Bordeaux Red! Express yourself and make your look POP with this delicious shade of Crazy Color Semi-Permanent Hair Dye in Bubblegum Blue. Achieve a sharp and sophisticated look with ease when you choose the Crazy Color Semi-Permanent Hair Dye in Burgundy! Wow and dazzle all your onlookers with this stunning bright shade of Crazy Color Semi-Permanent Hair Dye in Canary Yellow! Forget the boring and the drab shades of hair dye with a gorgeous shade of Crazy Color Semi-Permanent Hair Dye in Candy Floss Pink! Equipped with a bold and brilliant shade of Crazy Color Semi-Permanent Hair Dye in Capri Blue, your hair is certain to stand out from all the rest! If you're looking for a new vibrant shade then the Crazy Color Semi-Permanent Hair Dye is the certainly the new perfect product for you! Here at Dye My Hair, we are proud to have an expansive range of hair dye products that offers a huge range of colors, durations and variety. The possibilities are endless when it comes to our hair coloring products, let our expansive range of sublime shades be your artist’s palette when planning your new look. When you shop hair dye online with us, you’re sure to find the best hair dye, from the best and most iconic, hair color brands. 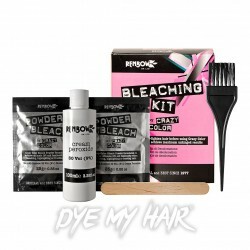 Not only can you select from the best hair dye products, but you can also pick up plenty of handy hair dye tools. You’ll find bleach kits, toners, gloves, brushes, bowls, shampoo, conditioner and pastel-izers – we’ve well and truly got everything covered! Whether you’re a complete dyeing novice or a home hair dye expert, there’s plenty of products that are essentials for your home hair dyeing kit. We’re all about new hair colors here, but we’re just as passionate about getting you the tools to achieve your look, no matter what your natural shade. The most fun you can have when browsing hair dye is picking your brand new and exciting hair dye color! Here at Dye My Hair, we have everything from bright hair dye colors to the subtlest tones of natural hair dye shades. With a selection of vibrant and bold colors, you’ll be able to pick from a huge rainbow of colors. Select from strong purple violets, gorgeous emerald greens, delicate bubblegum pinks, deep midnight blues, fiery coarse reds or sharp metallic silvers. If you’re going loud and proud with a jazzy shade of flaming orange or a dark finish of raven black, there’s something you can choose from in our selection! Get creative and go wild with your colorful dye imagination. Or, to take your look a whole level further, we have a whole range of UV hair dyes which can literally glow in the dark. Light up any room or dance floor with some bold iridescent shades that come to life under UV or blacklight. Luminous shades are a perfect way to show off an awesome alternative style. If you’re always hitting up parties or raves then a splash brightly colored glowing hair dye is the perfect way to bring a huge new neon style to the party. Color Selection – this is certainly one of the most exciting parts of buying new hair dye, but it is also a decision that must be carefully considered. Does the color match your complexion? Will the color cover over your natural dark hair color? Will the color suit you? These are all things to consider when browsing our huge range of products. With so many fantastic brands and dyes to choose from, you really will be spoilt for choice. Go get colour creative! Duration – with hair dye products that are suitable for a quick style switch up and some which favour a more long term solution. Temporary hair colorants, chalks and gels are the ideal way to change up your look for a night out, fancy dress party or Cosplay costume as the color will easily wash out after. Semi-permanent hair dyes can offer a color change for up to eight weeks, so you if you’re looking for something more long-term, then you’re sure to find something here that’ll help to switch things up for longer. Quantity – when dyeing your hair, you always want to have enough to cover your full head of hair. If you’re going to need a whole lot more hair dye, then some four packs which are sure to keep everything covered. Enjoy bargains when you buy in bulk, and if you’ve fallen head over heels for a new shade, rather than buying a single pack, why not go for a money-saving multipack so you can enjoy the same shades again and again. All The Tools – If you’re fed up of expensive trips to the salon, then we have everything you could ever need when experimenting with home hair dyeing. Brushes and bowls are certain must-haves when it comes to making your own unique hair dye styles. With all the tools such as bleach kits and toners, you can totally transform your look in no time. Styles – as well as a full new head of hair, you could always experiment with some new hair dye styles such as ombre or balayage to try out. You can always practice new looks with patch testing or temporary dyes to make sure you find the right style for you. If you’re completely stumped on how to take your look to a whole new level, then why not have a browse of our Pinterest boards for some more hair color inspiration? To keep on top of the latest hair dye trends, why not pop on over to our Dye My Hair blog?